Taking the time to delight in the present doesn't take anything away from the future. 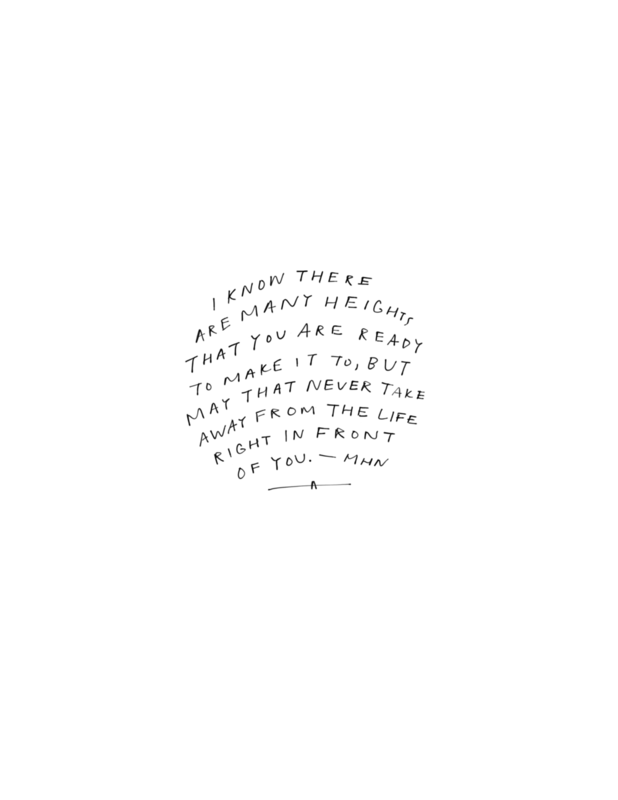 There is a life right in front of you that is ready to be lived. It might not be the life you always dreamed of, and it might be missing a few things, or a few people, but I promise you, it still matters. And taking the time to delight in the present doesn't take anything away from the future. Even when your hopes for the future are sincere and filled with good intention, you are being called to live this day in the same way. It won't be easy, though. You might feel like you are selling yourself short or settling for where you are, but the truth is, this moment is all you have. And the more you can began to accept it, the more you will find that there is more to the present moment than you have ever seen before. Perhaps an unlikely friendship can be cultivated today. Perhaps in the time you spend alone in the afternoon you can find the time to journal, or write a poem again. There are seeds to be sown here. There are plants that are already growing that are waiting to be watered. You may not be where you want to be, but in grace, you have what you need to make the most of the life that is right here in front of you. What is going to happening.